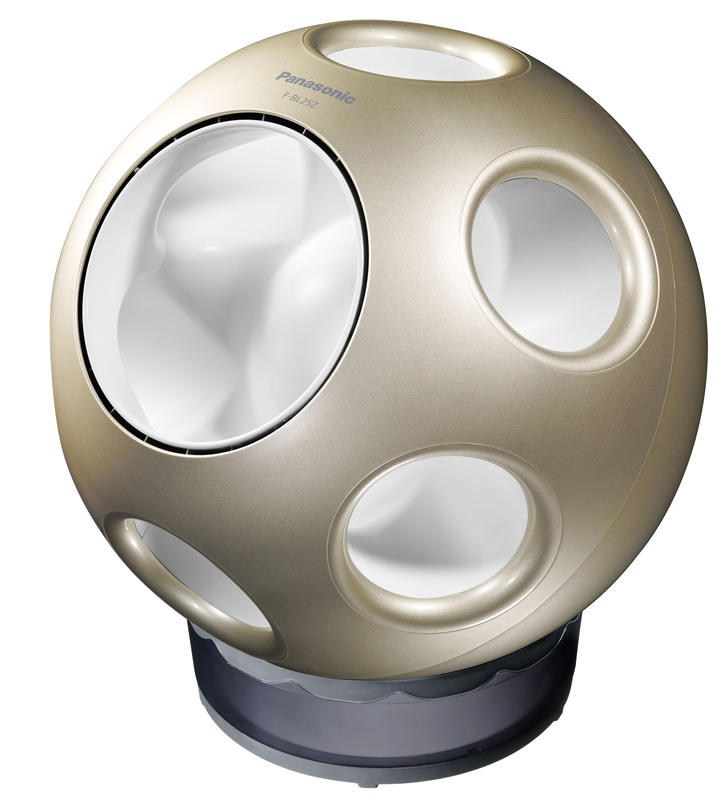 The Bladeless Air Generator "Q"
Panasonic Introducing the bladeless air generator "Q" F-BL25Z in Japan. The "Q" has features with a fluid-dynamic optimal design, the fan blows 7 times more air than it takes in. Tokyo, Japan - May 20, 2015 - Panasonic Corporation will release a unique ball-shaped bladeless air generator, "Q," which has a turbofan that maximizes air output and specially engineered channels that encourage additional air intake. It can be used as an air circulator and fan. In recent years, fans are being used for multiple purposes. For example, more and more people have begun to use them alongside their air conditioners to save energy. 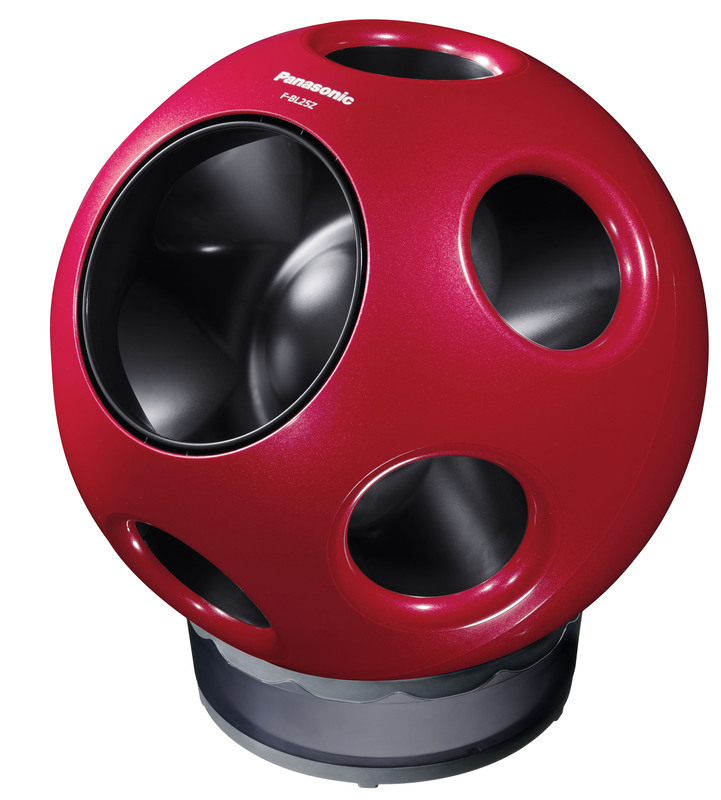 And research has shown that approximately 80% of people surveyed want compact fans with unique designs. (Panasonic research, N=105). 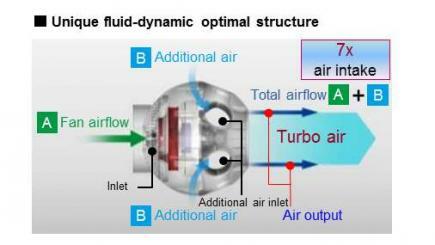 With a fluid-dynamic optimal design, the Q blows out 7 times[*1] more air than it takes in. It creates powerful, straight blasts of air to efficiently aerate and circulate air. The Q also features a "1/f fluctuation" that sends "natural, fluctuating wind" that protects you from overcooling. This natural breeze also prevents you from feeling tired when the fan is used for an extended period of time(*). Moreover, because it is spherical in shape, you can point the airflow in any direction[*2]. Its compact shape enables you to place it anywhere you like, and it can also be used throughout the year. With this product, we hope to help you enjoy a healthy, comfortable living environment. (*) Panasonic research (as published in the Japan Society of Physiological Anthropology). 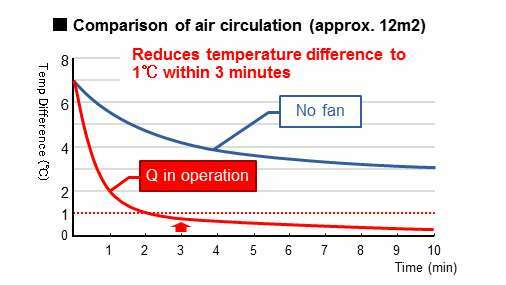 Nine people were subjected to approximately 20 continuous minutes of airflow generated by a fan (on medium airflow settings) and by the 1/f fluctuation. Then they were asked to answer a series of questions. Temperature in the room was 30 degrees Celsius, and the fans were set 1.5m away from the subjects. Effects will differ depending on the environment in which the product is used, conditions in the room, and on the individual. With a fluid-dynamic optimal design, the Q blows out 7 times*1 more air than it takes in. Creates a comfortable, natural breeze with its "1/f fluctuation" feature. 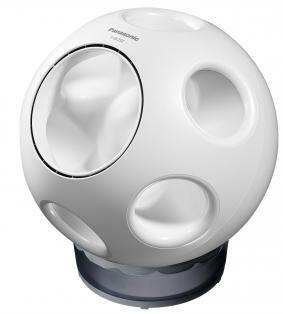 The unique, compact spherical enables users to point the airflow in any direction and set it up anywhere they like. *1: The air output at maximum settings (without additional air intake). Comparison between 1.2m3/min measured 0.75m away from the product (with additional air intake) and 8.6m3/min. *2: Cannot be pointed downwards. The fan does not pivot to change direction of the airflow. Creates powerful, straight blasts of air to efficiently ventilate and circulate air. In order to bring to life a fluid-dynamic optimal design, the product features a ball-shaped design. 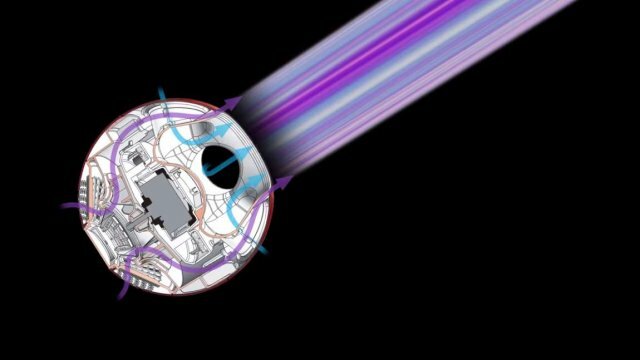 Once the air is taken in, the turbofan increases its pressure to generate a powerful flow of air. 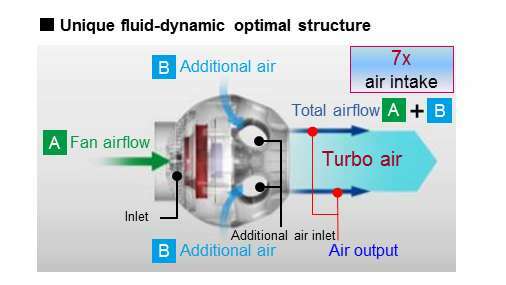 This airflow also pulls in additional air near the inlets, realizing powerful 7x airflow*1 consisting of strong, straight blasts of air. The powerful airflow significantly and efficiently helps the air circulate in the room. The compact, turbo-powered fan will provide great relief in the summer, as well as in a comfortable environment in the winter by helping to circulate the air in the room so that the temperature will be consistent throughout. *Results will differ depending on the environment and condition under which the fan is used. The Q is equipped with the "1/f fluctuation" feature, which is the fruit of 25 years of our research. In developing the "1/f fluctuation" operation control program, we studied the undulations of the the breeze blowing in the highlands of Tateshina. By micro adjusting the rotational frequency of the DC motor, the Q creates an extremely natural breeze. The irregular, comfortable breeze of different strengths prevents you from feeling tired when the fan is used for an extended period of time. [Note] Panasonic research (as published in the Japan Society of Physiological Anthropology). 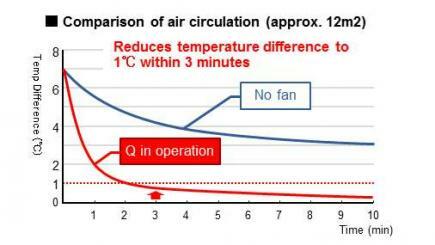 Nine people were subjected to approximately 20 continuous minutes of airflow generated by a fan (on medium airflow settings) and by the 1/f fluctuation. Then they were asked to answer a series of questions. Temperature in the room was 30°C, and the fans were set 1.5m away from the subjects. Effects will differ depending on the environment in which the product is used, conditions in the room, and on the individual. The "360-degree shape" lets you point the airflow in any direction. And the compact, stylish design lets you place the product anywhere, without it getting in the way both in terms of the space it takes up and interior design.